One of the most useful features of Twitter for events like conferences and tweet chats is the hashtag. A hashtag – a keyword preceded by the ‘#’ symbol – enables conference-goers, the event organizer and anyone else interested in the event to see all tweets that include the hashtag. It enables anyone to listen to the conversation and easily participate. People use the hashtag symbol # before relevant keywords (no spaces) in their Tweet to categorize those Tweets and help them show more easily in Twitter Search. Clicking on a hashtagged word in any message shows you all other Tweets in that category. The popularity of this useful device has captured imaginations everywhere. It’s getting harder to find events that don’t have a hashtag. Unfortunately, that popularity has also attracted the attention of spammers, bots and other unsavoury elements of the social web to the extent that hashtag hijacking is becoming increasingly common. It shows itself by tweets with content and links that include your hashtag but have no relation at all to that hashtag. The spam tweets in this screenshot are typical – they’re often suggestive and profane, usually with avatar pics of attractive-looking women, and with short-code links that you click at your peril. While you can just ignore them, the effect of them in your hashtag stream ruins the hashtag experience for everyone else. Until such time as there is a clear, effective and universal method of cleaning out such unwelcome content from your hashtag, there are things you can do to help Twitter address the problem. 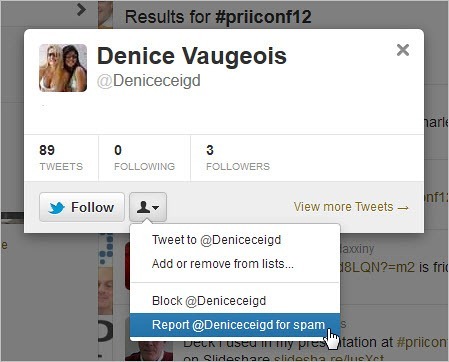 For instance, in your own account on the Twitter website, you should block and report the spammer to Twitter. You don’t have to ‘own’ the hashtag to do this. Click on the spammer’s name and you’ll get the popup you see above. Click on the dropdown link next to the ‘Follow’ button and you’ll see a menu. Highlight and click the ‘Report…’ choice. That interaction gets the ball rolling for Twitter to take the steps they need to do starting with reviewing the tweeter’s account and blocking it from your view while they investigate. If you use a third-party Twitter app rather than the Twitter website – TweetDeck, MetroTwit or others such as on mobile devices – most also include a means for you to report spammers. I’ve heard quite a few anecdotal examples of Twitter’s swiftness in addressing hashtag spammers (and others who violate Twitter’s rules), so they do take it seriously and take action when they’re made aware of problems by legitimate Twitter users. If you feel that a hashtag spam issue is really serious – eg, during an event where it’s pretty clear that your hashtag is being overwhelmingly hijacked – then you can address the matter directly with Twitter by filing a support-request ticket. Again, I hear anecdotal reports of Twitter’s swiftness in addressing such requests. Hashtag spam is a genuine problem, one that is increasing. While it does seem like a game of Whack-a-mole at times, grit your teeth and persevere! Report all instances to Twitter to help them do their job. It must be extremely frustrating for event organisers, when they see their hashtags being hijacked by these people / bots. It strikes me that solving this, could prove a tricky nut to crack. Thanks for bringing attention back to this annoying form of Twitter abuse, sir. I agree, Jim, this is a tricky one to address. 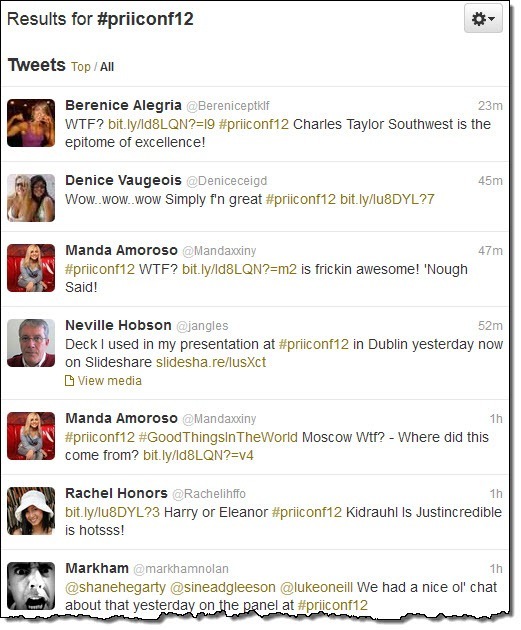 When I was at an FT conference recently, this was an issue where the event hashtag there was hijacked by spammers. Some interesting ideas emerged from people in coffee-break discussion, some of which I mentioned in my post about it (linked here). Twitter hashtag spam goes much further that just conferences. I’m regularly getting some in regards to all kinds of trending topics. It has happened while monitoring a crisis situation for a client as well as during major news events. No question about it, Marc, it affects any use of hashtags you can think of, such as the experience you mention. Twitter has now been a bridge between the actual consumers and the companies. And a lot of spammer taking the advantage of twitter. They are even more prolific on trending hashtags. I was sickened by the speed at which they started appearing on the #tcr hashtag yesterday. (I wrote about it here: https://plus.google.com/u/0/115764042730219591248/posts/XMy4fPCCacu) Within 10-15 mins. It makes me think that, like the tweet content itself, much of their activity is automated. ie triggered by a trend rank. Thanks Alastair. I think you’re right re automation. Bots do the leg work once they’re set up. As far as I know, the only ‘solution’ right now is to keep reporting it to Twitter. Basically when you block someone on one account it auto blocaks them acorss all the accounts you manage.